Remote work certainly has its advantages: broader talent pools, uninterrupted blocks of time for deep-focus work, and the quality of life that can come with the freedom to work wherever you choose. But like every setup, there are pros and cons — and the downsides aren’t what companies who are afraid of remote work or flexible schedules think they are. Employers who don’t want to let people work from home often think, How can I be sure they’re working if I can’t see them? What if they spend their whole day on social media? and so on. But in reality, studies show productivity stays the same or increases when people work outside traditional office settings. The real downsides to remote work are just amplified versions of problems that exist in co-located environments. 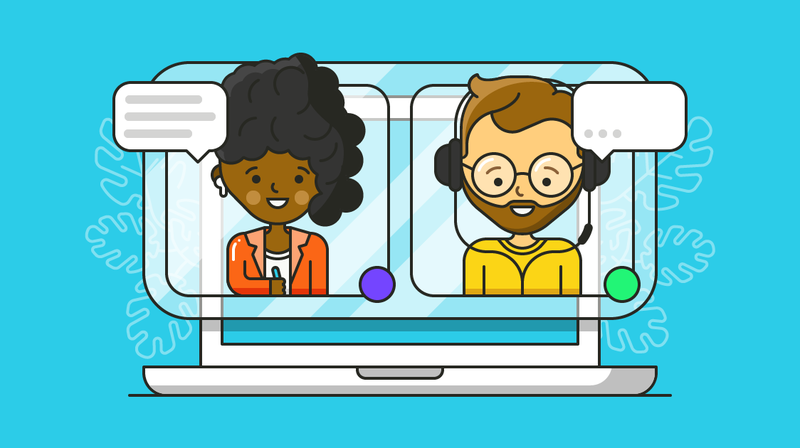 Remote teams excel at solving certain collaboration-related problems that co-located companies aren’t confronted with as keenly — but that doesn’t mean they’re not there. The difference is that co-located companies don’t have to solve for them because it’s easier not to. (You can wing a lot of decision-making in an office environment, for example — just hop into a conference room and figure it out.) Since remote companies don’t have that luxury, they’ve been forced to solve for the problems that accompany asynchronous communication. Traditional companies can learn from some of these tools and processes that remote companies already have down and make their workplaces more collaborative and inclusive for everyone. These issues affect every team who has to communicate asynchronously, or in ways other than sitting across from one another at the conference table. Here’s how we address them at Help Scout. Think of the last email chain or Slack conversation that spun out of control because the people involved were talking about different things, coming from different places, adding their own contexts, and so on. Misunderstandings can happen with more frequency in workplace setups where face-to-face communication isn’t the norm. And at least at first, it’s tricky to identify the moment where it’d really be best to call time out; the instinct is to react and reply, only that makes the problem worse. Problems get blown out of proportion because we think so much faster than we type. The way around it is to learn to pinpoint this situation the moment it starts, and either a) hop on a video chat, where you have the benefits of tone of voice and a little bit of body language to help you convey meaning, or b) walk away and pick it up later after your emotions aren’t getting in the way of clear communication. When your default communication is email or messaging, you are prone to missing out on additional context. At Help Scout, we acknowledge this by encouraging people to “assume miscommunication over malice.” We include that phrase in our employee onboarding — we tell new team members that if they ever feel like their integrity is being questioned, to assume it’s a communication misfire, and not because their team member actually thinks they’re bad at their job. When you’re collaborating asynchronously, it can create a situation where one stakeholder is constantly waiting for the other, with longer periods in between where work is just sitting there — and that can exacerbate any “us-versus-them” dynamics that might already exist between teams. The antidote is to have rock-solid processes in place. On my team, for instance, we have a robust editorial process we manage via Trello: Once I’m good with a draft, it goes to a copyeditor, then it comes back to me, then I send it over to the design team, who codes it up in Github and puts it up on staging, then the author and I review it there, then there’s usually some more back-and-forth … and then it can go live. It takes dependable tools and a tremendous amount of proactive communication to ship things on time. Alternative workplace arrangements are not less work. Nothing is “set it and forget it.” Help Scout’s stack includes Confluence, Slack, Trello, Dropbox Paper, Google Docs, Zoom, Wistia, and a number of other tools we use to keep our team aligned. We do our best to be relentlessly communicative and put everything in writing. It’s not a bad habit for any kind of company, though, remote or not. No one ever complained because it was too easy to find the information they were looking for. Remote work doesn’t work for everyone — and that goes for people and companies. It’s not an option for many kinds of businesses, and it doesn’t work for every person, either. Occasionally, people new to remote working find out that it doesn’t suit them. They feel alone; they get cabin fever (especially when they’re in a different time zone than their team), and they realize it’s just not for them and that they prefer going into a traditional office. And that’s fine. Semiannual company retreats, when the whole team meets up in person for a week. Weekly video updates that keep the team informed about new feature releases, birthdays, and other company-wide news. “Troop Talks”— casual, monthly video chats the whole team is invited to. We’ve talked about how we practice self-care, songs we associate with a poignant memory, and all manner of topics that elicit these lovely stories that may never otherwise come up at work. Obviously, co-located teams don’t struggle with these things as much — there are plenty of organic moments for team-building built in when you’re all together. But what good remote companies do really well is offer a lot of different ways for team members to build relationships, and that’s where co-located companies can sometimes fall short. Team happy hours can be fun, for example, but they’re not always everyone’s jam — they can feel exclusionary to non-drinkers, people with families, and others. So if you host happy hours, consider also hosting team breakfasts, or planning short midday offsites, lunch-and-learns, and other team-building activities so that inclusive company culture becomes the default. The need for better asynchronous communication is increasingly relevant to all kinds of teams. The way things are heading, we’re seeing more and more nontraditional work arrangements — not just remote work, but flexible schedules, the need for communicating across cultures and time zones, and so on. Even if you work in an office, chances are you work with contractors, offshore teams, freelancers, and other collaborators who aren’t onsite. And at some point, we’re all remote: We’ve all missed the proverbial memo when we were out of the office for one reason or another. The problems remote workers have — feeling out of the loop, unclear documentation and so on — those happen in every office. Thinking about how remote and asynchronous teams collaborate successfully, despite not always being face to face, and applying those solutions to all kinds of workplaces, can help foster better communication and belonging everywhere.